Rubber Sep is a latex liquid that creates a peelable film. 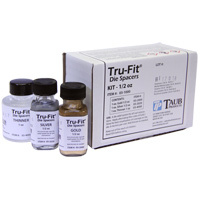 It is a die spacer, release agent and separator for acrylic and composite resin restorations. Paint a thin coat onto a preparation and let it dry which takes a few minutes. 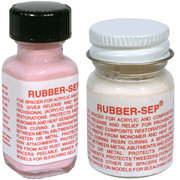 The pink Rubber Sep dries translucent red and white Rubber Sep dries clear. The prep now has a 12 micron coating that allows the resin to cure onto the surface, making the cured resin easier to remove. 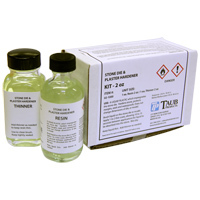 Acrylic resins tend to shrink when they cure and tighten onto the prep, making it difficult to remove. This can result in breakage of the stone model. Rubber Sep makes removal easier and results in space between the prep and the inside of the provisional for cement space. When applied intra-orally, using an instrument, the rubber coating does the same thing as on a stone model, but also prevents the free monomer of the resin from harming the tooth. 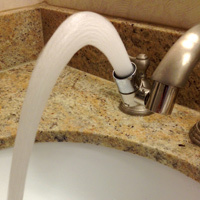 It also acts like a thermal barrier from the heat generated as the resin cures. This gives the dentist the added security of knowing that the resin will not attach to the tooth, which would make removal more difficult, should the resin begin to cure prematurely. When using Rubber Sep intra-orally, place a drop on a mixing pad. Work off this pad, so as not to contaminate the rest of the Rubber Sep bottle. Rubber Sep has been shown to be very effective for providing the extra volume on the labial surface of the model for bleaching gels. By applying the liquid from the bottle with the convenient applicator brush, a film of 12-18 microns (or more if desired) is formed after the liquid has dried. Air or heat hastens the drying time. The vacuum formed plastic bleaching tray does not stick to this and the color does not transfer to the tray. After the tray is formed, the film can be peeled off of the model. Rubber Sep is easier to apply and less expensive than the light cured materials..
- Separating agent between metal abutments and stone plaster. - Protects tweezers from acid rust.